Guiding rock, day in and day out in the Gunks is easy. You find a routine, including a selection of appropriate routes, a way of presenting useful information, and perhaps a set of conversation pieces you might use throughout your day with clients. Then you use some variation on that routine most of the time. Onsight guiding bigger objectives with people you don't know that well is a whole different game. 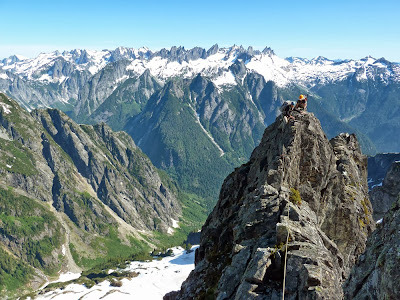 I've recently returned from a trip to the North Cascades, where I climbed Mt. Triumph with two climbers of very different climbing backgrounds. My partners for the trip, Ron and Paul really couldn't have been more different in terms of experience. 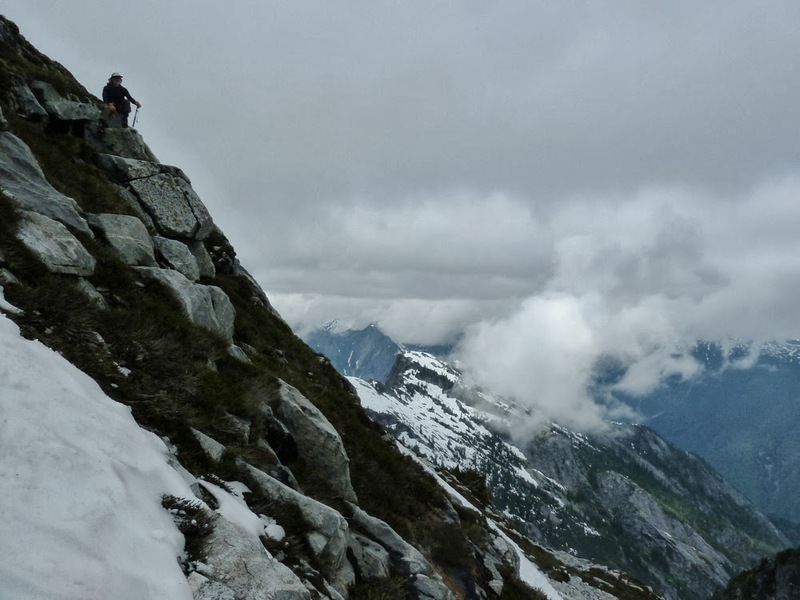 Ron has hiked or climbed in more countries than most guides I know, and at 68 continually impresses me with his fitness and willingness to push himself. He climbs rock and ice and has backpacked throughout many of the world's greater and lesser ranges. Paul, 33, on the other hand, has two full-time jobs, a bit of rock climbing experience and one Rainier trip to tuck in his belt. Our trip was a last minute sort of affair too. All of us purchased tickets and booked the rental car less than two weeks prior to the trip. Once things were all set we me met in Seattle. Even our objective wasn't settled upon until we arrived at the ranger station in Marblemount (things are generally subject to permit availability in popular spots like Boston Basin anyways). We settled on Mt. Triumph, knowing that it was new, unfamiliar and potentially attainable given the fact that Paul had rock climbed enough to be relatively comfortable with that medium. Besides, Triumph is a big, dark, solitary sentinel guarding over the very rugged and remote Picket Range nearby. 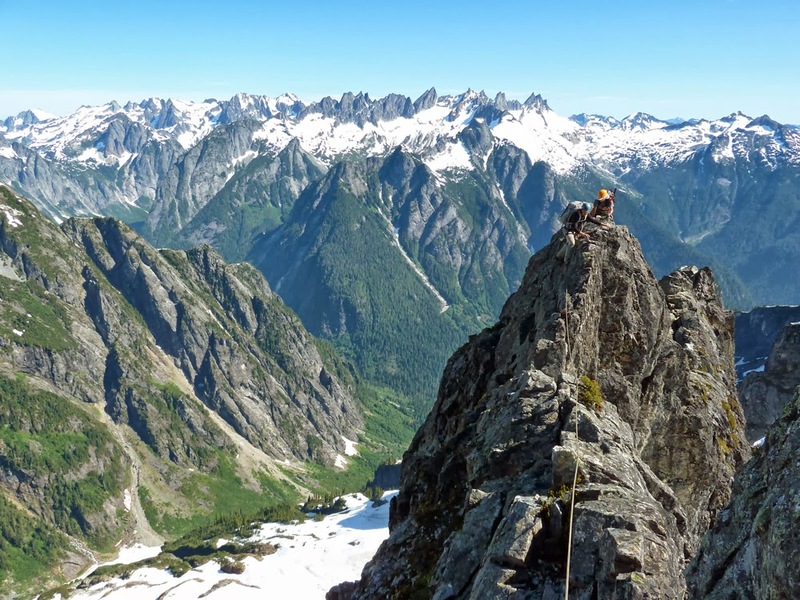 It begs to be climbed and lies in an incredibly beautiful remote valley. Our hike in, through low clouds, was sufficiently arduous and relatively uneventful; uneventful is never a bad thing either when you're in the mountains. Arriving at the col, alongside Thornton Peak, and high above the Thorton Lakes we scooped up the only wooded bivy site, almost made our spacious 3-person tent fit, and enjoyed a bit of rest before heading up the ridge on nearby Thornton Peak. 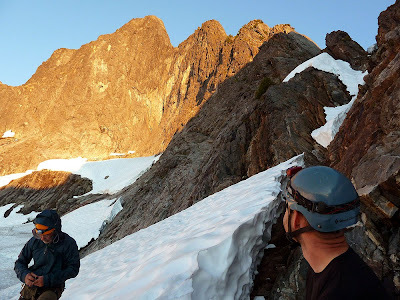 Our short hike consisted mainly of low angle snow and steep heather climbing (one of the finer, safer activities to be had in the Cascades;) with an occasional 3rd class section of climbing. Our timing, and the choice to delay our summit day was fortuitous. The hike gave Paul precious time to get more comfortable with our mode of travel - loads of scrambling . The additional waiting gave us a clear weather window too. It had been cloudy with low visibility above 5000' for the past two days. As we munched on trail mix at 6500' on Thornton Peak the clouds began to break up, giving us a good feeling about our chances as a group the following day and better views of the ridge we were planning on climbing. 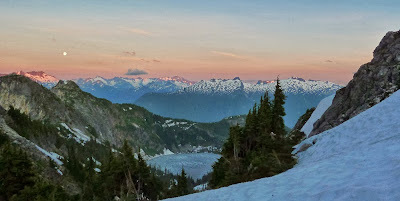 Accounting for the inverse proportionality of alpine starts (the earlier you get up, the slower you move getting out of camp in the predawn hours), we awoke extra early the following day; 3 a.m. to be exact. By 5 a.m. we were out of camp. We were dialed and ready. By 5:15, at our first steep descent on snow, Paul was looking pretty nervous. Oh boy, we needed to get to the rock so he could be comfortable again. By 6:45 rock shoes were on his feet and things were looking pretty good. We passed the narrowest portion of the ridge (and Paul's most nerviest section) by 11:15 and were all smiles up top by 1:20 p.m. after countless pitches of fun semi-loose 3rd to 5th class rock. After a snack of a little water and some dry salty cheese to negate our water intake we departed the summit and headed down the South Ridge. Looser, but more direct, this route ended up being the way to go. After a bit of wandering to find the route lower down we were back on the glacier 5 hours later. Tired, but teeming with joy and excitement we headed back to camp. Paul had pulled off what I consider to be one of the more amazing displays of determination I've seen as a guide. Ron, right behind him on the rope, had made it all possible with his directions, words of encouragement and support throughout the day. Our final day had us hiking down and heading to Anacortes for burgers and beers at the Rockfish Grill. After a heady little buzz at this fine joint we dried and reorganized gear at Washington Park in Anacortes. Anacortes, a beautiful seaside town is the perfect antidote to the mountains - there are restaurants, parks and beautiful bays to sit beside and do absolutely nothing. I am continually amazed at how adaptable people can be when placed in stressful situations. Ron was willing to stake his trip on Paul's abilities despite the fact that Paul had expressed serious concerns about holding the group back. Paul had pushed himself hard and was deconstructing many of the fears he came with on this trip. Both of them had trusted heavily in my ability to get them up and down one very long rock ridge. Looking back, this 4 day trip was one of my best. Not only did I have amazing partners, good weather and a great climb, but I was reminded of how unique my line of work can be sometimes. People trust you to take them safely through very dangerous places. It is precisely at this stressful place, when things might seem improbable but in fact are completely possible for a person, that growth occurs. Being the person to facilitate that growth for Paul made this amazing trip even more rewarding. Ron and Paul, thanks for the good times!